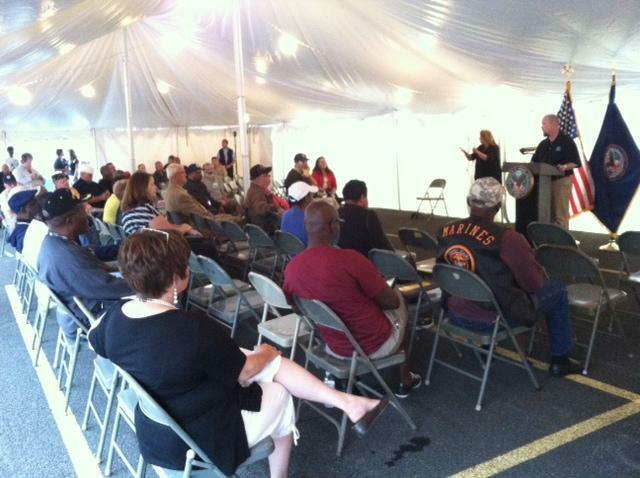 Veterans gathered together for Martinsburg VA Medical Center's first town hall meeting. A group of impassioned veterans showed up to a town hall meeting at the Martinsburg VA Medical Center last week to voice a litany of complaints. But for the most part, they did NOT echo the national outrage about wait times for doctors' appointments. Instead, the veterans raised issues ranging from homelessness to hospital food. Timothy Cooke is the new Medical Director at the Martinsburg VA Medical Center. The event last Tuesday was the first ever town hall meeting organized at this facility. 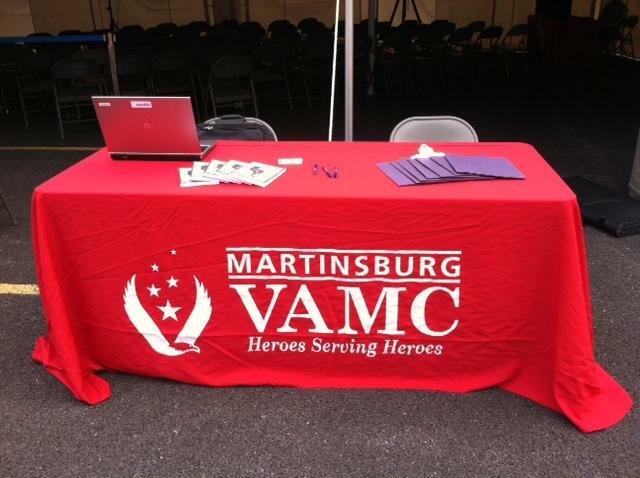 The Martinsburg VA serves about 44,000 veterans; about 50 showed up to the meeting held just outside the Center under a large, white tent. The 20 who spoke brought up a wide range of issues. There were several comments about homelessness, particularly from veterans who live on-site at the Domiciliary, widely referred to as the DOM. It provides transitional housing for 66 homeless veterans, but they can only stay for so long. Several speakers, like Bill Plater, are worried about what happens when their time is up. About 180 additional veterans live in the DOM while they’re undergoing inpatient treatment. Several residents complained about problems with mail service. Phillip Stonestreet said he’s been waiting seven weeks for one letter. Other concerns included the status of caregivers, complaints about paperwork, and a complaint about the food. Only one veteran, George Dubose, brought up the problem that’s getting all the national attention -- appointment availability. New patients at the Martinsburg VA Medical Center have to wait more than 32 days, on average, to get an appointment with a primary care doctor. That's lower than the national average, but the second highest in the state. Center Director, Timothy Cooke said that issue is his main focus. Over the course of the meeting, the feeling amongst the veterans seemed to shift from frustration to a sense of relief at the chance to voice their concerns to the medical staff. “Did you feel like you were heard tonight,” asked West Virginia Public Radio reporter, Liz McCormick. “Yes I did," answered Frank Cayer, "He was very sincere and very open. I was surprised." Cayer was in Vietnam for part of his 15 years of service, between 1970 and 1985. Army veteran Ahkenaton Bonaparte, served for ten years during Desert Storm and Desert Shield and says he travels from Baltimore to Martinsburg, because he gets better treatment here. 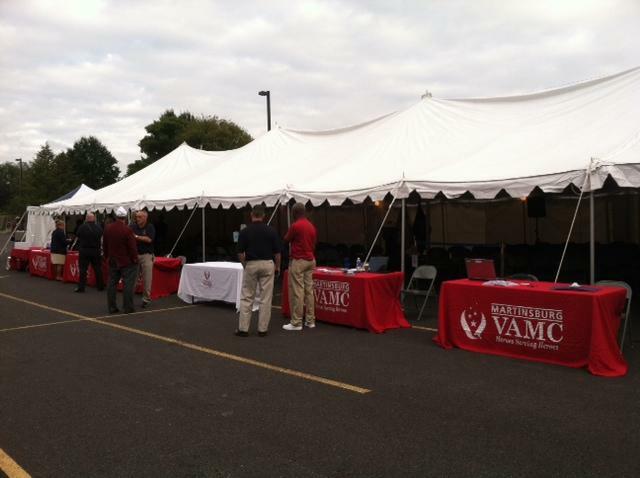 As the event wrapped up, veterans were eager form more public meetings in the future. Center Director Timothy Cooke says that’s a definite possibility.